It’s not always easy to juggle the holiness and special mitzvot of Rosh HaShana with the holy task of taking care of kids. Here’s a basic list of the most important mitzvot of Rosh Hashana, and the simplest way to go about doing them. This is a checklist for women in general, and especially women who are taking care of children or pregnant. Hopefully, just knowing exactly what you need to do (and what’s an added extra) will take some pressure off and allow you to approach the festival a bit calmer. You’ll be lighting candles both nights of Rosh Hashana, so make sure you have a 25-hour candle burning so you have a flame for 2nd-Night lighting. Don’t have a flame to light with on second night? That’s what neighbors are for – take a flame from them. We recite “Shehechianu” both days – but it’s good to wear something new on the second night as an extra halachic reason to say it. So, if you can get someone (hello husband – hint hint) to buy you that new dress / jewelry and put it on for second-night candle lighting, or put a new fruit next to the candles (remember to save a new fruit for this and not eat it on the first night)* – that’s great. Don’t have anything new? Say Shehechianu anyway. You should have a meal with kiddush and wash for bread both nights and both days of Rosh Hashana (4 meals in all). If you’re exhausted on the 2nd night, you can do a “minimalist” meal – hear kiddush, wash, and eat a slice of bread, then bentsch. Don’t forget – a woman can make kiddush and also do her own “hamotzi.” So if your husband is at that yeshiva minyan that goes on forever, you can always make kiddush and have a holiday meal before he comes home. If you get to them, great. If not – there’s always next year. Apart from what you regularly daven every day and on Shabbat, you should make a special effort to daven Musaf on both days of Rosh Hashana. This is the longest Amidah of the year (and, in my opinion, the most beautiful) so give yourself some time for it. If you can’t get to shul for Musaf, it can be recited alone any time during the day. Even though women are technically exempt from the mitzvah of Shofar – all Jewish women go to great lengths to hear the shofar on both days of Rosh HaShana. But if it’s absolutely impossible for you to hear it this 1 year, you don’t need to do an annulment of vows (hatarat nedarim). 100 shofar blasts are blown in shul – but you only need to hear 30 for the mitzvah. A. Get to shul and listen to the blessings before the blowing, and then the 30 Shofar blasts before musaf (these are called Tekiyot D’Meyushav)..
B. 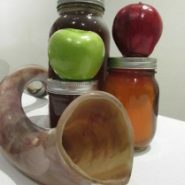 Listen to three sets of 10 shofar blasts during the repetition of the Musaf Amidah (after each of the three special blessings in the Amidah [Malchuyot, Zichronot and Shofarot] they blow 1 set of 10 – you need to hear all 3 sets). C. In some shuls (mainly Chassidic ones), they blow shofar 3 times during the silent Amidah – you could listen to 3 sets of these (3 x 10 = 30). D. At the end of Musaf, there are many extra shofar blasts (in some shuls 40, in others 10, others even more). If at your shul there are at least 30 shofar blasts at that point, you can fulfill the mitzvah by listening to them. E. Someone can blow especially for you (or a group of women together). If so, one of the women (Ashkenazi) should recite the blessings beforehand. All these options are good. Ashkenazi women may say the blessings over the shofar themselves before hearing their 30 Shofar blasts if they didn’t hear the blessings being recited in shul. But even if you didn’t say or hear the brachot – you have fully fulfilled the mitzvah. Make sure you can hear the Shofar clearly, and not as a muffled sound from another building or room. And make sure you’re hearing someone really blowing the shofar for a mitzvah – and not someone practicing or a kid playing around. Have intention to do the mitzvah. All additional kavanot (about accepting Hashem as King, about Teshuvah etc) are only extra. If you managed to get yourself to hear the shofar and do the mitzvah, you’ve done a fantastic job! Shofar extra credit – Listening to the whole 100 blows … But not if that means being under pressure, neglecting the kids, or feeling sick, or weak. [A point of shul etiquette – Babies and little kids who cry and make noise during the shofar blowing may cause others to miss hearing the blows, and miss the mitzvah. A suggestion that has worked for some mothers: Team up with another mom, and have her watch your kids in the park while you hear the first 30 blasts, and then swap over so she can get into shul for the next 30. On the 2nd day, change the order so as to be fair to all]. Tashlich is a longstanding custom – but it’s only a custom, and if you can’t get to it, that’s fine. In fact, if you want you can do it up until Hoshana Raba. So perhaps, plan for your husband to watch the kids and have some time for yourself after Rosh Hashana– go to the beach, pond, or river and recite Tashlich with focus and feeling – make an outing of it! Of course the overriding mitzvah of Rosh HaShana is to accept Hashem as our King – so if you can find time to think about that, or read something inspiring, or recite Psalms – you’re doing great! Even if you only manage to focus when saying the words “Melech Ha’Olam” [King of the Universe] during ONE blessing and really mean it, your Rosh HaShana was worth it. Start with that, and work up from there. May you be written and inscribed for a year of only good – for you, your families, and the entire Jewish people. *Put the new fruit on the table so your husband can use it for the Shehechianu for kiddush – and then you’ll eat it during the meal, without another Shehechianu.